It's another wash day. I decided to forgo one of the steps in my shedding plan which was to go one and a half to two weeks between wash days this time around because my new growth was starting to feel dry. 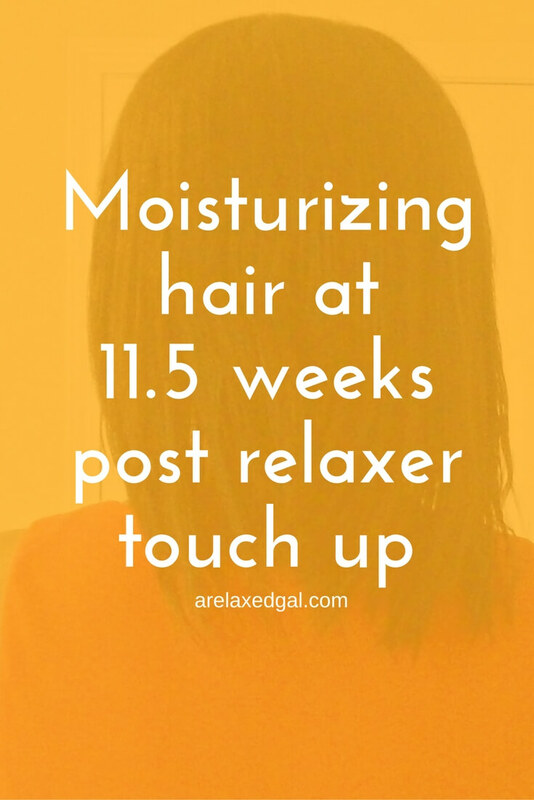 Since I was experiencing dryness my focus was on putting some serious moisture back in my relaxed hair by steaming and using moisturizing products. Pre-pooed: Since I had dry detangled the night before with the assistance of some sunflower and coconut oil I went right into my pre-poo. My mix this wash day was sunflower oil, coconut oil, honey, and Suave Natural Infusions Moisturizing Conditioner with Macadamia Oil. I let this sit on my hair for about 30 minutes under a shower cap. Cleansed: After rinsing I cleansed with Eden BodyWorks Jojoba Monoi Moisturizing Shampoo. This is where I started to run into issues. I planned to do a green tea rinse after cleansing and forgot to brew the tea during my pre-poo! So there I was in the shower debating whether or not I'd get out and brew the tea. Since I'm trying to combat my shedding I decided to get out and brew the tea. This added about an extra hour to my wash day since I had dry off, wrap my hair in a towel, brew the tea and wait for it to cool. Oh well...I'm hoping it was worth it. Deep Conditioned: After the green tea rinse I applied Eden BodyWorks Jojoba Monoi Deep Conditioner and did a steam treatment for about 20 minutes. Here's how I did the steam treatment: I put a shower cap on my head, wet a towel and warmed it up in the dryer, wrapped the towel on my head and then covered my head with a plastic bag. Steamed: I let my hair cool for about 10 minutes from the steam treatment and then rinsed with cool water. Leave Ins: I towel dried for 30 minutes then applied the Pantene Moisture Mist Detangler, Eden BodyWorks Coconut Shea Leave In. Dried: Next I let my hair air dry for another 30 minutes and then sat under my hooded drier with my new growth stretched to finish drying. I have to say, my hair tends to hold moisture better when I sit under the dryer than when I air dry. I'm not sure why, but this is something I will be looking into. Sealed: After my hair cooled for a few minutes, I sealed with a mix of sunflower and coconut oil. The results were pretty good. My relaxed hair felt more moisturized than it had in a while and I think not completely air drying had something to do with that. There was minimal shedding, so I think the green tea rinses are working. I'm not sure how much of an effect the steam had as the towel I used was a bit big so it was hard to wrap it around my head and I don't think the towel got as hot as it could have. I do plan on trying the steam again next wash day. 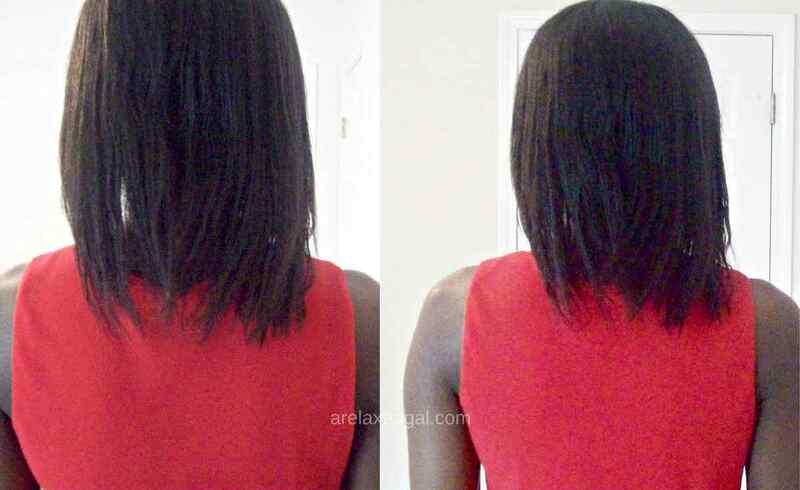 I did notice after taking my pictures that I could see through my relaxed hair, particularly on the left side. I think that's the result of my shedding (sad sigh). I'm hoping it's because of the new growth shrinkage causing some sections of hair to be shorter than others. How have your moisture levels held up this summer? I experience dryness a lot because I color treat my hair. What I am doing now to try to retain moisture is applying castor oil to my hair while it is wet and after adding all the products to my hair. When my hair was relaxed, I use to do some of the things that you are doing such as deep conditioning. Aphogee helped me out a lot too when I was relaxed. 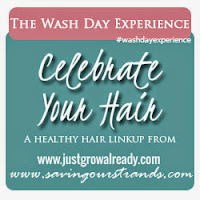 Thanks for sharing your wash day experience! I love these posts! I'm so sorry that the shedding did that to your hair. But it still looks thick so the intervention was right on time. Thanks Yvette. That's what I'm hoping for, that I've been able to head off any major shedding issues. I'm sorry also but agree, it still looks thick. Have you tried combing your hair differently to see if that changes the see through areas? Shedding is the debil. I would suggest black tea and/or black strap molasses for the shedding. I also like the Alter Ego garlic conditioner. I used to shed like a cat with mange. Thanks for the tips Tiki. I thought about black tea, but heard it can make your hair feel hard, so I thought I'd start with green tea first. I never heard about using black strap molasses for shedding, I'll have to look into that. I forget to grab my tea rinses too! My hubby complains about the water trail from the bathroom to the kitchen all the time. The things that we do for our hair!